Dexpot for Windows 10 - A multifunctional utility that allows you to create multiple desktops on your PC. The program can be controlled by hot keys. Software is an easy-to-use tool. The application allows the user to create up to 20 simultaneously active desktops, each of which will differ in its background, set of icons. Integrated viewer module through thumbnails. Switching the tables between themselves is carried out using the toolbar or moving the cursor to the edge of the screen. There is a special mode of open windows in which they are minimized, but the title remains. 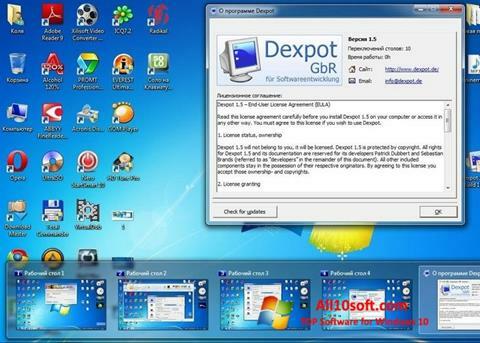 You can free download Dexpot official latest version for Windows 10 in English.